Located on the Connecticut Junior Republic's Litchfield campus, the Cable Academic and Vocational Education Center (CAVEC) is a private, special education school accredited by the New England Association of Schools and Colleges (NEASC) and approved by the Connecticut State Department of Education. Regular, special, vocational and alternative education, as well as enhancement classes and transition and related services are provided for up to 74 boys, ages 9 to 21. Just 2.5 miles north of the Center of Litchfield on Route 63, CJR's 150-acre rural campus is situated in the scenic rolling hills of Litchfield County and includes a working farm, acres of agricultural and playing fields, a stocked pond fed by the Bantam River, and both indoor and outdoor recreational facilities. The Cable Academic and Vocational Education Center is approximately one hour from Danbury, Hartford and New Haven, and one half-hour from Waterbury. For directions, please click here. 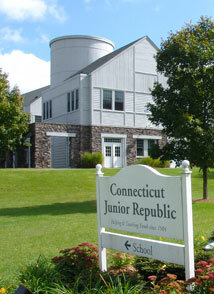 The Connecticut Junior Republic’s Boys’ Intermediate Residential Program (BIRP) for young men referred by the Court System is located on its Litchfield campus. Funded by the Judicial Branch Court Support Services Division (JBCSSD), the BIRP is designed to engage youth and their families through individual and family clinical services that focus on identifying and developing inherent strengths within the family unit to improve the relationships among all members. Based upon a model of service developed by Dr. Gayle Dakof and Dr. Howard Liddle of the University of Miami’s Leonard M. Miller School of Medicine’s Center for Treatment and Research, this program integrates Multidimensional Family Therapy (MDFT) into its framework of services for boys and their families. The inclusive, family-focused therapeutic model is used throughout the program’s four-month residential component and continues for an additional four to five months within the youth’s home environment following discharge from the residential program. This continuum of care is designed to ensure a smooth transition back into home, school and community for each young man served. The BIRP fully utilizes the outstanding educational and recreational resources on CJR’s Litchfield campus and all students attend school at the Cable Academic and Vocational Education Center. The Junior Republic’s BIRP is the first residential program in the United States to fully integrate an evidence-based, family-focused, in-home intervention for this at-risk population of young men. The program has a capacity of eight youth. Funded by the Department of Children and Families (DCF), the Connecticut Junior Republic Residential Program (CJRRP) is a four-month residential program for committed delinquent male youth, ages 14 to 18, who have mild to moderate substance abuse treatment needs and may also have co-occurring mental health disorders. Designed to decrease recidivism and criminal activity; decrease substance use dependence; improve educational functioning and mental health; and increase stability and overall family functioning by incorporating the principles of Multi-Dimensional Family Therapy (MDFT) into all aspects of each youth’s treatment experience, the CJRRP opened in July of 2016. Based in the newly-renovated Hartford Cottage on CJR’s Litchfield campus, this program provides intensive integrated mental health and therapeutic substance abuse services for enrolled youth. CJRRP participants attend the Junior Republic’s Cable Academic and Vocational Education Center and benefit from all of the educational, recreational and therapeutic resources located on the organization’s 150-acre rural Litchfield campus. Using MDFT allows for an evidence and research-based model to be combined with life skills training and prosocial activities to enhance residential programming. CJRRP staff work extensively with boys and their families to ensure re-engagement and connection to family, community, and other support networks. The program also coordinates intensive and comprehensive aftercare services for enrolled youth. Services provided by the CJRRP include screening, comprehensive assessment, case management (including case planning and discharge planning), individual therapeutic services provided by an MDFT therapist, family therapeutic services provided by an MDFT therapist, psycho-educational and cognitive behavioral groups (such as Boys’ Council), education and vocational services, social and independent living skills, prosocial and recreational activities. The Therapeutic Respite and Assessment Center (TRAC) is located on CJR’s Litchfield campus and serves up to eight adolescent boys referred by the Court System, ages 14 to 17, for one to three months, depending on their needs. Students attend school at CJR’s Cable Academic and Vocational Education Center and benefit from all the resources on CJR’s Litchfield campus. Residential services include individual and family therapy that is designed to enhance protective factors, increase affective bonds and de-escalate crisis situations. The TRAC Program involves families in programming from the beginning of each boy’s enrollment. Motivational skills are used to prepare participating youth and families for each young man’s return home and to ensure continued participation in support services that are arranged prior to a boy’s return to his community. Services in the community begin immediately upon discharge from the TRAC Program and may include an additional three to six months of intensive home-based, family-focused care, such as Multi-Systemic Therapy (MST), which CJR provides through its community-based programs in Danbury and Torrington.